Happy 2019 friends! This was the most uneventful New Years that Alex and I have ever had. As in, we didn’t even stay up for the ball to drop on New Years Eve. But Alex was adamant about having a New Years kiss. So after we went to bed at 10 PM, I woke up to an alarm at 11:59 that Alex had set so that we could get our New Years kiss in at the correct time. Since I was only half awake, I promptly fell back to sleep, only to wake up to another alarm at 5:30 AM to get ready for work (because healthcare doesn’t sleep, and never shuts down, even for holidays). This was the first year that I hadn’t stayed up for midnight, and in all honesty, I was completely fine with it. Yes I enjoy spending time with friends and family, watching the firework shows around the world, and popping some champagne/sparkling cider at midnight. But I’m not really one to view the strike of midnight as some transformative event. I woke up on New Years this year feeling the same as I had in 2018. The only thing that changed was that I know had to write a different date when signing documents. However, I do still like writing down some “resolutions”. Because while I don’t believe that the new year on it’s own will change me, I do like the concept of a time in which to reflect on the past year and ways in which I wish the new year to be different. I took my sweet time this year in order to be intentional, and realized that most of my goals have a similar characteristic - GROWTH. I want to grow in my health by drinking more water and eating less red meat. I want to grow my knowledge and challenge my thoughts by reading more nonfictional books, especially ones pertaining to the current culture/climate. I want to have personal growth by stepping out of my introverted comfort zone more often. And finally, I want to continue to growth this food blogging/food photography hobby of mine. I realize that these potential growth opportunities won’t come easy, and like all paths to improvement, will also be accompanied by failures, but I am hopeful that I can stay focused and not give up when said failures happen. Alright, enough rambling from me. Let’s talk about these simple, sweet treats. 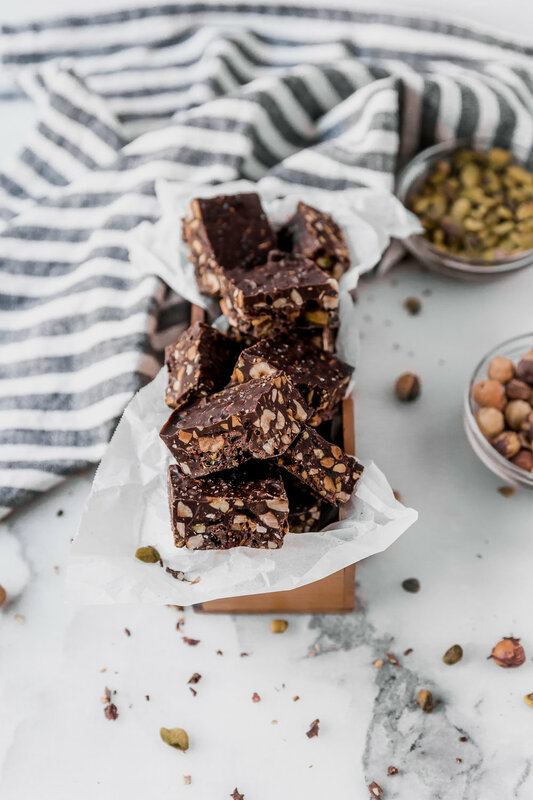 This recipe LITERALLY only has 4 ingredients - chocolate, hazelnuts, pistachios, and dried cranberries. It is the perfect post holiday treat when you want something sweet, but not heavy like most holiday desserts. These chocolate bars are gluten free, and you can even change the type of chocolate that you use in order to also make them vegan/dairy free. And the best part is that they are incredibly easy to make! Not a hazelnut and/or pistachio fan? Feel free to change out the type of nuts that you use (keeping to the same overall quantity, of course). The versatility, yet simplicity of this recipe are my favorite things about it! Preheat oven to 350F. Line an 8"x8" pan with parchment paper, and lightly spray with nonstick spray. Set aside. In a separate small pan, roast the nuts until lightly browned (~10 minutes). Let cool completely. Coarsely chop. Remove from heat. Add the cranberries and coarsely chopped nuts. Stir until well combined. Pour into the prepared pan. Using an offset spatula, spread the chocolate evenly. (Optional) Sprinkle with sea salt. Refrigerate (uncovered) for ~1 hour, or until the chocolate has firmed (but isn't rock hard). To cut, first allow the chocolate to warm slightly at room temperature (this will allow for easier, even cutting).